Let's admit it: It happens a lot. Even when you pay careful attention to the audio you record for a video, and you used a good mic (you did use a good mic, right? if not read this...), you can still end up with a bunch of background rumble and noise in your recording. It happened just the other day to someone at the video production company I work for. They were shooting in a grocery store, capturing some interviews. They used a good shotgun mic, with good directivity to cut down on the ambient noise. However, there were those dreaded coolers all over the store, and if you listen carefully (mainly because our brain normally tunes them out), you'll hear compressors running. Back in the studio, it sounds like a truck going by the entire interview. Because it's a complex noise source, trying to run a noise reduction program on it probably won't work well (and even when the noise goes away, it is often replaced by unwanted digital artifacts of the FFT process used to perform the noise reduction—but that's another post). However, we do have one tool in our utility belt that can help (actually two, I'll get to the second, which should actually be the first, in a second): Enter the high pass filter. 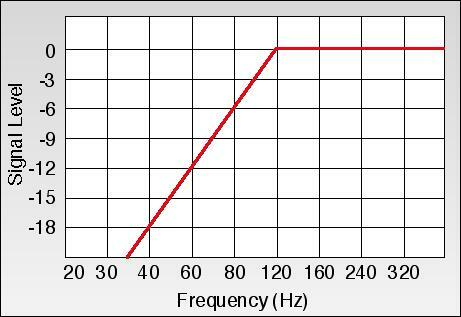 A high pass filter is just what it sounds like—it lets high frequencies pass, while blocking low frequencies. Super-basic HPFs are a simple on and off switch with a pivot frequency (the frequency at which it "passes" signal) and slope (how quickly it drops off the signal below the "pass" frequency) set at the factory. Better HPFs that come with higher level editors like Premier Pro and Final Cut allow you to select the pivot frequency. Here is an example of an HPF with a pivot frequency of 120 Hz, and a slope of 12 dB per octave (that is, at the frequency 1 octave below the pivot frequency—60 Hz—the level will have been reduced by 12 dB). You can see how the frequencies above the pivot frequency pass by unaffected, while the ones below get rolled off pretty quickly.This is when it actually gets useful. For the male voice, the fundamental frequency of the lowest notes one speaks is between 85-155 Hz. For a female, it's a little higher, perhaps 165-225 Hz. This means that there is no real information that we need below 85 Hz for males and 165 Hz for females. And in reality, because of the way we hear and the way the voice is produced, there are plenty of harmonic frequencies that our brain will interpret clearly to make up for missing fundamentals. So let's say we have a compressor running in the background of a female interview. We can safely dial up a HPF with a pivot frequency of 165 and not loose any of her voice. We can take it up even higher to eliminate more of the noise, and the clarity will improve markedly. In fact, the voice will "sound" louder once the low frequency stuff is removed because we can hear it better. So this is exactly what we did for grocery store woman. We dialed up an HPF with a pivot at around 150 Hz, and it totally transformed the audio. There was still some higher frequency noise, and it was obvious she was standing in the store and not a studio, but the clarity of here voice was improved substantially. If I have time later this week, perhaps I'll grab a before and after sample and put it up here. Earlier I mentioned we actually have 2 tools in our tool belt. The other one may be on the mic itself. Many professional shotgun mics (and some interview mics, and the occasional lapel mic) have a HPF built in. For example, my beloved Audio Technica 835B has a switchable roll off at 180 Hz at 12 dB per octave. That means at the lowest fundamental of a male voice the mic will be 12 dB down, which is generally not a big deal unless you're interviewing James Earle Jones. Normally, I like to leave this switched on because it eliminates a lot of room rumble, AC noise and other nasties right at the source. It's just a good idea. If you use this when you shoot, you will require less processing in the edit suite. Of course, you'll want to listen to it through some good headphones first to make sure you're happy with the sound. You do have good headphones, right?